As one of Europe's biggest outdoor adventure brands – and with major expansion underway in global markets – Berghaus faces the challenge of communicating its new, design-led positioning to a broadening, international consumer base, while maintaining its essence as a performance-oriented, British-born company. Following a global strategy review in 2016, Berghaus commissioned Speak Media to produce copywriting and tone of voice guidelines that would inspire and support its marketing teams and agencies around the world in the delivery of consistent, on-brand communications. After a detailed review of the new brand model and the industry landscape, taking in consumer insights and in-depth stakeholder interviews, our creative team distilled wide-ranging brand inputs to three core tonal values: ‘passionate’, ‘straight-talking’ and ‘playful’. At the heart of the new approach was a move to a more open, conversational, human approach – replacing the overly technical and detail-oriented personality that the brand’s lead marketers felt was limiting its ability to appeal to broader audiences. The guidelines themselves comprised of five core sections, including tips that encourage Berghaus staff to think about engaging storytelling approaches, and model copy covering every key channel (from social media posts and e-commerce product descriptions to above-the-line adverts) – with detailed rationales explaining how and why each example works. We also produced audience personas and an extensively researched glossary featuring hiking, climbing, running and landscape terminology, to help brand marketers and writers bring products to life in the right context for different segments, based on their real-world activities. 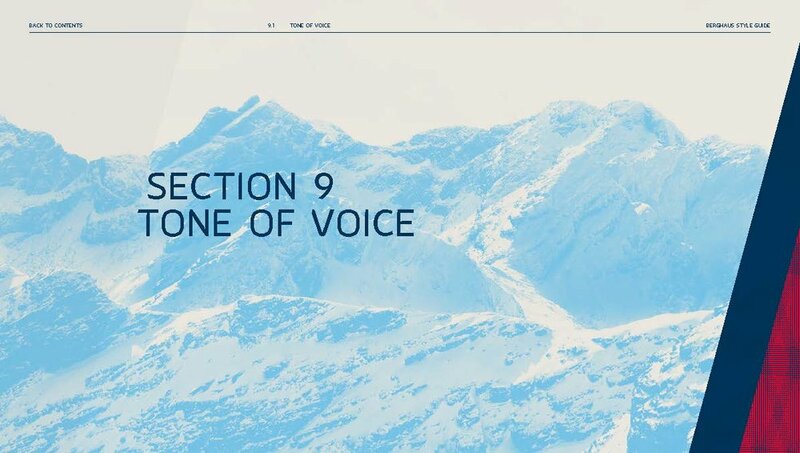 The tone of voice guidelines – which live on the brand’s global marketing hub – have been downloaded and reviewed on a daily basis as a source of creative inspiration for the brand's marketers and agencies in every region, helping to convey the brand's new positioning message in a consistent and engaging way to a variety of audiences, across a range of channels. The model copy created by Speak’s writers “exceeded expectations” according to feedback from Berghaus’ global marketing team – and was immediately repurposed for use in presentations to staff and trade partners as a way of helping them understand and embed the new positioning. Brand copy in every channel is showing the new guidelines in action – including descriptions for high-end (and best-selling) products that reference Kendal mint cake, “warm fuzzy feelings” and “‘can I go home now, please?’ weather”.